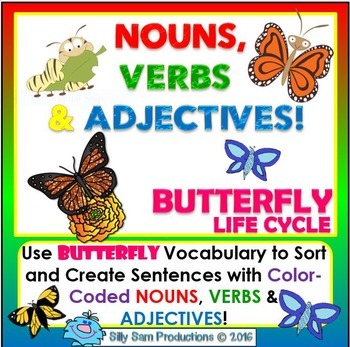 BUTTERFLY LIFE CYCLE Nouns, Verbs & Adjectives Activities! A Fun Way to Practice PARTS OF SPEECH! Use Butterfly Life Cycle Vocabulary to Create Sentences! DIFFERENTIATED OPTIONS! 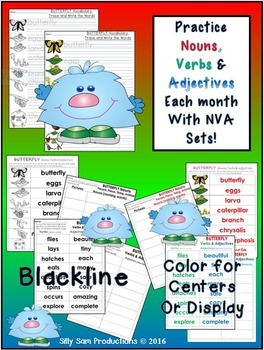 Black-line and Color for *Centers *Writer’s Workshop *Whole Group Lesson *Homework! Have students practice these important GRAMMAR SKILLS! 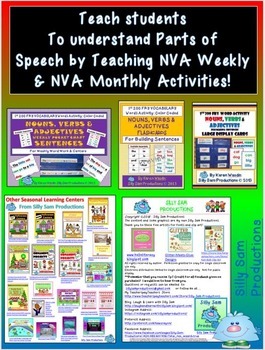 Look for NOUNS, VERBS AND ADJECTIVES ACTIVITIES FOR EACH MONTH at Silly Sam Productions! Practice these important skills all throughout the year for a more comprehensive understanding! Proven Results! Use this program with the other Nouns, Verbs and Adjectives all-year programs at Silly Sam Productions! Some More Nouns, Verbs and Adjectives Products at Silly Sam Productions! Plant Power Nature Magic Poem. What Can Be Found Underground? Integrated Science Language Arts Unit.